Austin, TX – Peckerheads was relatively empty when I strolled in after a hectic Morning Benders set in the always crowded Emo’s Jr. A rock trio was on stage. And after they’ve finished I wondered why no one was preparing for the next gig. It turns out that they have 2 parallel stages, and I had almost missed Maps and Atlases‘ opener when I found out. They drew out a good number of folks considering it’s a Wednesday afternoon. Easily 150 people packed into a room 25’x60′ to see Dave, the furry frontman (our nickname for him is now teddybearman) and the rest of the band play. Similar to (maybe even more so than) Ra Ra Riot, Maps and Atlases hardly follows a lead-in, chorus, repeat recipe. 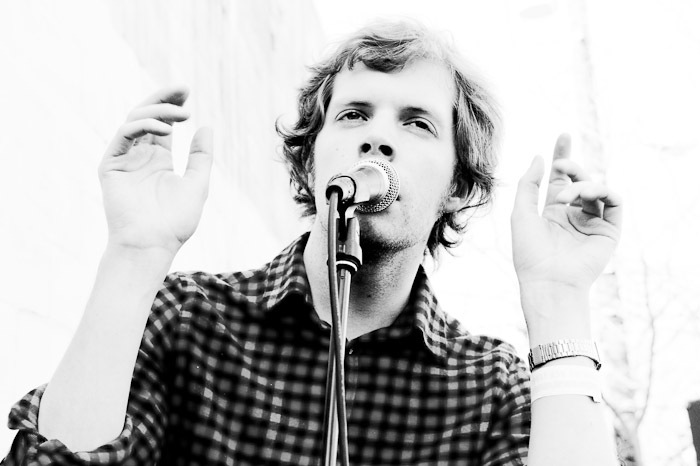 Instead their tunes consist of small guitar/bass and vocal pieces that you might arrange as you like. They follow into each other nicely, but doesn’t sound like any order is necessary. The melody is also not in accord with your expectation, which is very cool to listen to… but being the choir boy I’m at a loss of what to hum when I’m listening to them… it creates a little frustration. My labmate’s favorite from them, the Ongoing Horrible, can literally be played on repeat forever (and is actually the only one I could sing to). Live, they sounded very clear and crisp. I think their strong suit must be the guitar scores. Witch might be everyone’s choice. Their CDs, however, can be difficult to track down. I tried twice to find it without success. Apparently way too few were made in the first pressing – this is from teddybearman’s manager who took a break from dancing vigorously to speak to me. Always a good sign to see that people are into their work! 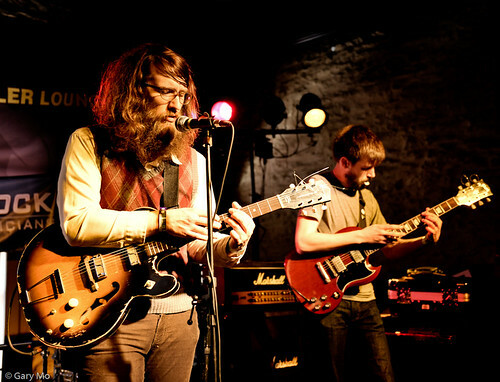 Go and see Maps and Atlases – they are coming to Toronto again in May. Let’s hope they bring that CD pressing machine with them. I might add that you can clearly hear these lyrics – which is rare at a rock concert. I think the crowd melted on the spot, and the rest was really history. Temper trap displayed all the right characteristics of a larger-than-life rock band, including just enough theatrics and attitude. The Australian group had already been well-received – 500 days of summer featured the song above, and their songs have had more plays than a lot of the indie bands featured here, also evident by the fact that they’ve sold out at an upcoming show (Mod Club) in Toronto. I guess they’re a Killers kind of band? 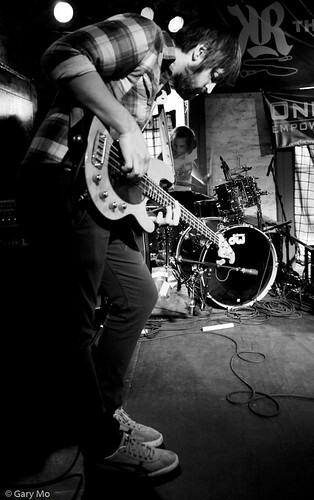 Their myspace mentioned they are melodramatic – I don’t know about that, but they’re definitely catchy and can be mood-building. 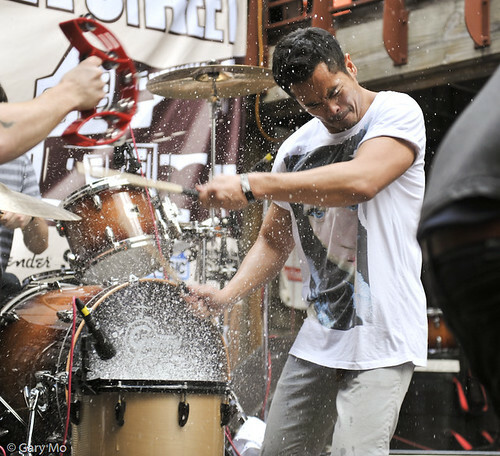 Drums are a clear constant in their tunes – the intermissions are often just solo vocal/guitar with drums. In fact there’s a number called “drum song” – which the vocal (who, btw, has a thin falsetto that’s quite good) used as a showcase to wow the crowd – dumping water on the drums and creating something of a taiko moment. When I listened to the album afterward there were a few snippets here and there that I could link to other famous songs – there’s one riff that I can swear is from Hotel California, and I kept wanting to compare their hooks to Thievery Corp., although I don’t know if that’s really appropriate. Also showcased at SXSW was: Love Lost, Down River, and Resurrection. 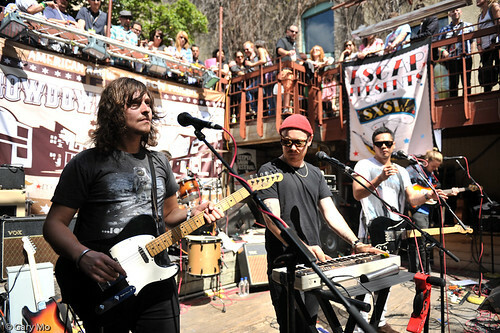 Overall, Temper trap was definitely the surprise hit of SXSW this year for me. Dr. Dog came on after Local Natives, as the anchor of the Filter party. 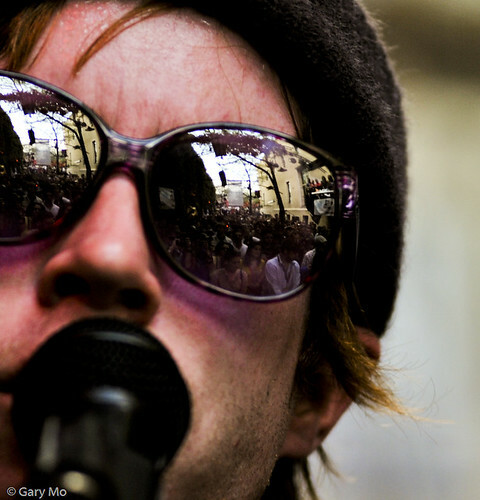 I had listened to them prior to SXSW and expected them to a bit mellow – obviously I was mistaken. The guitars and the bass were constantly wriggling on the stage! Many of their songs actually have a heavy Beatles feel. The Breeze, and Hang on, for example, for me draws parallel with and Mother Nature’s son and Hey Jude. Far from being unoriginal, however, Dr. Dog has their own brand of lifestyle rock; you’d want to: first sing along, then change your outlook on life (regret, break-down, and cry optional) and then go live on the Californian coast with copious amounts of mushrooms. Ok, maybe only I do and I’m projecting. I had doubts that some of the songs can be played while totally rocking out instead of the polite proper rock of Beatles. I guess it works fine. The crowd really enjoyed their energy – evident from the number of people who streamed in to see them. But my pet-peeve is an incongruity between their song and stage presence. Their music deserves a listen aside – there are suppressed tones that suggest good o’times passed, and other quirks that just didn’t come to me while live. Their myspace will give you a very good idea of what I’m talking about. 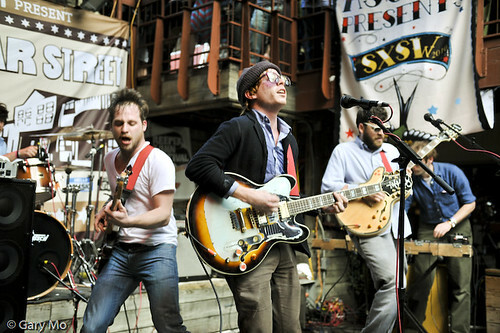 I’m looking forward to Dr. Dog recreating their album’s feeling on stage. That will be very good times indeed. 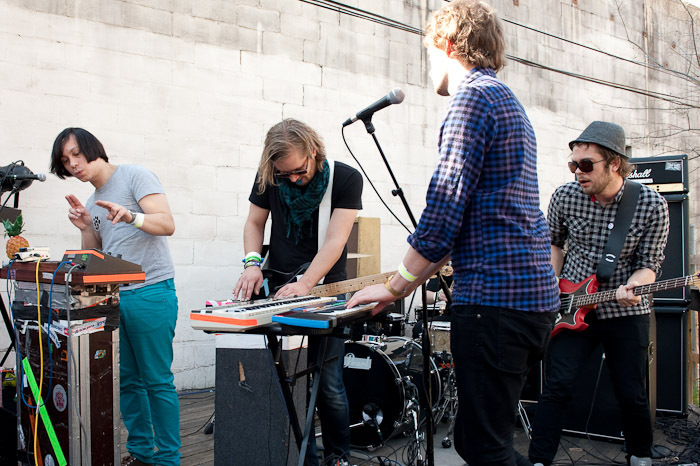 My first SXSW show was Casiokids at Creekside Lounge. I hadn’t heard of them before, but figured if they had the word “Casio” in their name that I would be in for some dancing. They did not disappoint. These 5 norwegians ply a potent, airy, dancy electro-pop that had the crowd dancing, even if we didn’t understand a word they were singing. With multiple vintage Casio keyboards, a cowbell and guitar pedals labeled: “Rock, World, Jazz, Sweden & Grunge” how can you go wrong? Austin – As much as I’d like to write long drawn out reviews for these three acts, I will be the first to admit that my memories of these shows are slowly fading and it’s best to just get’em out there. One of the most hyped bands coming into SXSW, Neon Indian is riding the wave of 2009 album Psychic Chasm into Austin hoping to capitalize even more on the chillwave phenomenon. Much to my surprise, he actually has a band. I was really expecting some guy with a synth and a few thing-a-ma-jigs. The live sound definitely changed the dynamics a bit as it suddenly became an electro rock show. However, the soundcheck dude probably forgot to test the microphone’s volume vs the guitars as Alan Palomo’s vocals were frequently drowned out by the instruments around him. Although a bit raw, there’s definitely good potential for a good live show as the music is definitely more energetic then on the album. Palomo’s got an interesting stage act as he basically clenches the mic really hard, stares really intensely into space and bops up and down while singing. Kinda like when someone is karaoking really hard. Great show by British singer songwriter who is also in Toronto March 30th at the Wrongbar. Playing to a packed house at the British Embassy, VV Brown displayed her vast array of talents singing songs off her excellent album Travelling Like the Light. Not stopping there, the charismatic singer also did a cover of Drake’s Best I Ever Had and a reggae dub version (citing her influences) of Crying Blood, all while wearing a hat she claimed to have taken from a military officer. A rousing retro pop closerShark in the Water had people moving and put people in a great mood for the rest of the night. Highly Recommended. I’ve been a fan of BRMC for a long, long time. Probably since you were a kid. I remember back when me and Vik were kids, Vik really liked the BRMC Palm logo and even thought about tattooing his arm with it. It’s been awhile since I’ve seen BRMC and since then they’ve changed their drummer (bye bye Jago) and adopted a more bluesy low key sound. Since I was a fan of their rock n roll stuff, I wasn’t sure how I felt about the band since their transformation. Sticking to the roots, the both front vocalists stuck to their leather jacket look despite the fact that it was probably 25 degrees centigrade outside. Some might call it stupid, some may call it commitment to the art. There’s quite a fine line. 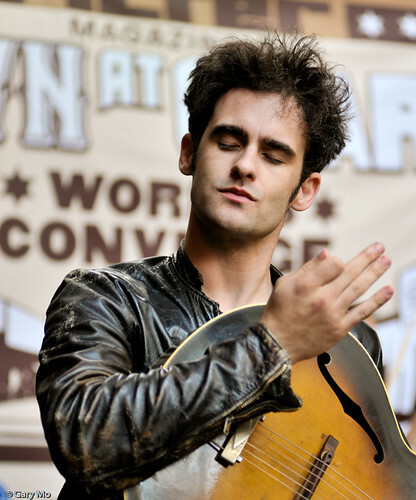 With two acoustic guitars, BRMC played selected songs from all their albums, including the new one – Beat The Devils Tattoo . I believe they played Love Burns and Shuffle Your Feet among others. It’d be easy to complain about the songs they didn’t play (Love Spreads, Weapon of Choice, US Government..) but given the 35 minute constraint and the urge for the band to reestablish a relationship with their fan base after the disastrous The Effects of 333 album, I’d say BRMC are back on the right track and we are all going to be just fine.